Matt laminated midi sling bag in the 'stem check' print with leather trims, double sided adjustable webbing strap and leather magnetic tab for closure. inside details include sand linear stem jacquard lining, small leather logo card holder pocket, small zip pocket, elasticated key chain and mobile pocket. silver coloured hardware. Adjustable webbing tape strap that allows the bag to worn as a shoulder bag or across the body (max length 108Cm). Matt laminated midi sling bag in the 'stem check' print with leather trims, double sided adjustable webbing strap and leather magnetic tab for closure. Inside details include sand linear stem jacquard lining, small leather logo card holder pocket, small zip pocket, elasticated key chain and mobile pocket. Adjustable webbing tape strap that allows the bag to worn as a shoulder bag or across the body (max length 108cm). 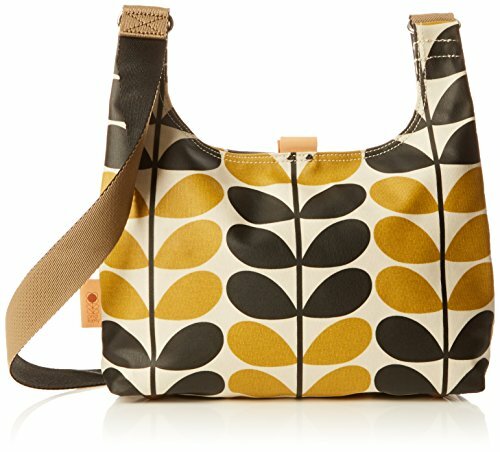 If you have any questions about this product by Orla Kiely, contact us by completing and submitting the form below. If you are looking for a specif part number, please include it with your message.